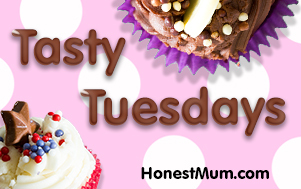 I don’t know about you but I’m a big cake and dessert fan, yes you’d never tell with my svelte physique, not! On Monday I made a family dinner and didn’t have any desert. 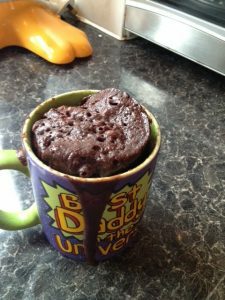 I didn’t have time to make a cake, but I did have time to make some chocolate cake in a mug. I wasn’t sure how it would turn out, but it’s better than nothing I thought. In less than five minutes I had made and cooked, yes cooked I think is a better word than baked, a chocolate cake. It tasted not too bad, it hit the right spot and I’d definitely make it again. It was a little drier than I’d like so next time I’d try putting it in for less time. All in all I thought it was tasty, plus there are lots of things you could add to it that you have sitting in the cupboards. Small amount of vanilla essence if you have it. 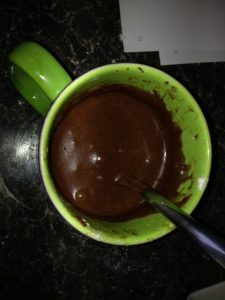 You can add some chocolate, peanuts, nuts, peanut butter, syrup anything you like and push it down to the middle of the mug. I then put it in the microwave for 3 minutes. It came out full and fluffy but a little dry. I think I’d try to reduce the time this is in the microwave for next time. Another tip, make sure you mix all the flour etc in the edges of the mug or you’ll end up with some flour at the bottom. Here’s what it looked like when it came out. It looks all right doesn’t it. I’m not a fan of cream so I didn’t serve it with this but cream I guess would be nice with it. It comes out of the mug quite easily too so you could serve it on a plate. I however didn’t want any more dishes to wash up so just ate it out of the mug. Lady like and all. Let me know what you think and if you make it, please add any of your tips.